A window that provides some basic features needed for all apps. Definition at line 95 of file controls/ApplicationWindow.qml. The stack used to allocate the pages and to manage the transitions between them. It's using a PageRow, while having the same API as PageStack, it positions the pages as adjacent columns, with as many columns as can fit in the screen. An handheld device would usually have a single fullscreen column, a tablet device would have many tiled columns. 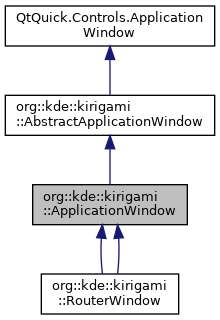 Definition at line 107 of file controls/ApplicationWindow.qml.